Floodwaters surging in southern N.B. Voters flock to the polls in P.E.I. HALIFAX -- The group aiming to bring a Canadian Football League team to Halifax added a little more colour to its proposal Wednesday, announcing a name-the-team contest and an initial short list of names aimed at reflecting the regional nature of its bid. Among the proposed names: The Atlantic Admirals, Convoy, Storm, and Schooners. They will be considered in a contest that will be exclusive to those who sign up during a season ticket drive aimed at gauging interest in a franchise for Atlantic Canada. "Fans will be presented with a number of options as well as an opportunity to submit their own name," said Anthony LeBlanc of Maritime Football Partnership. "We've been out talking to the community and getting what we feel is the short list, but we are not sitting here saying it will be one of those," said LeBlanc. "We may be blown away with some of the suggestions that are put in through the opportunity to write in your own name." He said the team name would be announced at a Nov. 23 event during Grey Cup festivities in Edmonton. 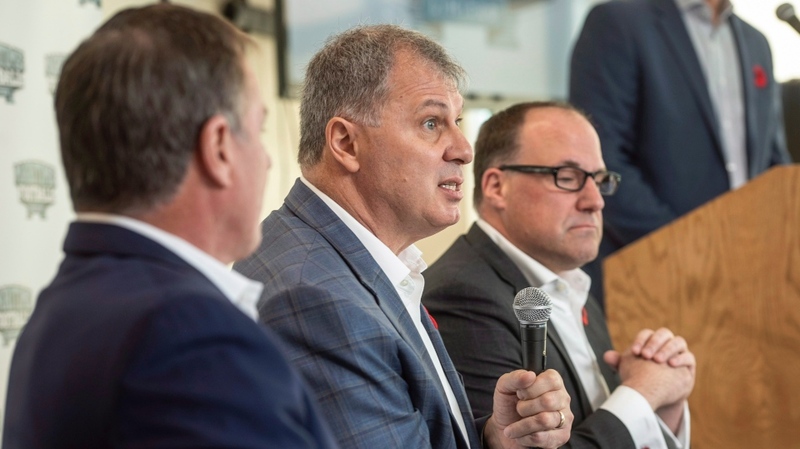 The season ticket drive was to begin immediately on Ticketmaster, LeBlanc said during a news conference in Halifax with group partner Bruce Bowser and CFL Commissioner Randy Ambrosie. Season ticket deposits are $50 per package, and place fans on a priority list for season ticket membership and seat selection on a first-come, first-served basis. Ambrosie said the league has no minimum number of season tickets it wants to see. "We haven't established an artificial threshold for what we determine as success," said Ambrosie. "We are going to be looking to Bruce and Anthony and Gary to help us understand their perspective on how well this campaign for season tickets goes." But LeBlanc said it is important to get a "nice base of season ticket holders" to help fill a proposed 24,000-seat stadium. "It's possibly an artificial number but I'd like to see us at least have half the building that is filled with season ticket members and I think that's very achievable if you look across the league. There is an onus on us to do our job and go out and sell the vision... but this is now an opportunity for people to really take action." Maritime Football is made up of former Arizona Coyotes co-owners LeBlanc and Gary Drummond along with Bowser, president of AMJ Campbell Van Lines. The group is looking to secure a conditional expansion franchise to begin play in Halifax in 2021. "It won't be the end of the world if that slips a year," LeBlanc said, while revealing that a potential team could start a season in Moncton, N.B., while a stadium is constructed in Halifax -- a process he said could take 18 to 22 months "once shovels are in the ground." "We don't have any real definitive answers on that (Moncton) yet," LeBlanc said. "Those sort of discussions will continue." Efforts to land a team in Halifax, Atlantic Canada's largest city, cleared a major hurdle last month after regional council directed city staff to do a business case analysis of the stadium proposal. The partners have proposed Shannon Park, vacant land on the east side of Halifax harbour, as the stadium site, and say the $170-million to $190-million project would need public money. While the funding model has the potential to be one of the more contentious issues around the bid, LeBlanc said the biggest roadblock to success would be if his group doesn't do a good enough job of "sharing the story and sharing the plan" with the public. "We're confident that we will remove all of the roadblocks, but no, I don't anticipate that it will be a smooth ride to the end of the stadium," he said. "There might be a bump or two along the way." Ambrosie said the CFL is ready to eventually welcome a tenth team into the league and he wants it to be Halifax. "We are going to be doing everything we can to get these last few hurdles crossed so that we can get to the finish line," Ambrosie said. The big unknown for Halifax's CFL bid: Is a stadium viable? Voters in P.E.I. have shed their century-old embrace of the Island's two-party system, by failing to give the victorious Progressive Conservative party a majority and handing the upstart Green party official Opposition status for the first time.